This is a pre-publication draft of an article to be featured in the Spring 2014 issue of the Brooklyn Journal of Corporate, Financial & Commercial Law. The Securities and Exchange Commission (SEC), which oversees activities in US financial markets, is charged by Congress with formulating rules to protect investors and the general public by facilitating capital formation and fostering fair, orderly, and efficient markets. The role of economic analysis in shaping those rules is crucial in view of their impact on the US economy, as Congress recognized when it required the SEC to conduct economic analysis in making its determination whether new rules are in the public interest. In a new study from the Mercatus Center at George Mason University, senior research fellows Jerry Ellig and Hester Peirce find significant shortcomings in the SEC’s use of economic analysis in seven major final rules promulgated by the SEC before the issuance of its March 2012 staff economic analysis guidance and one major rule issued after the new guidance. It is too early to draw strong conclusions about the effectiveness of the new guidance. Congress recognized the need for an evidence-based assessment of the problems the SEC seeks to solve, requiring the SEC to conduct economic analysis when it determines whether new rules are in the public interest. Federal appeals courts recently vacated several SEC rules due to inadequate economic analysis. The SEC published staff economic analysis guidance in March 2012 similar to the requirements for regulatory impact analyses (RIAs) of major regulations that executive branch agencies are expected to conduct. The economic analysis accompanying most of these regulations was seriously incomplete and rarely used. 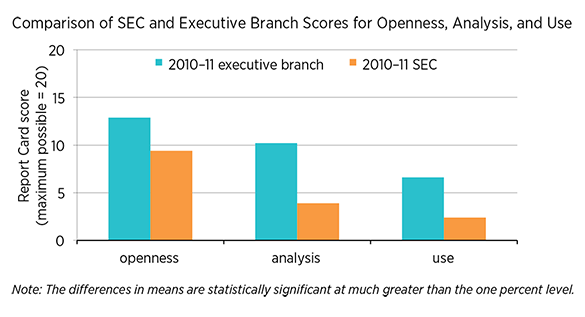 The SEC regulations examined in this paper scored well below executive branch regulations proposed in 2010–2011 (see figure below), including the executive branch regulations that were most directly relevant to the topics in the SEC’s March 2012 economic analysis guidance. The pre-2012 SEC analyses often failed to seriously assess the problem the regulation was supposed to solve. The pre-2012 SEC analyses often ignored important alternatives that should be obvious to an expert agency. The pre-2012 SEC analyses often ignored significant costs and asserted significant benefits without providing evidence that the regulation was likely to achieve them. A more comprehensive economic analysis may be more costly to the agency in the short run, but in the long run may significantly increase the benefits or reduce the costs of the regulations adopted. An agency that is not committed to careful, well-supported, transparent economic analysis tends to base its rules on speculation and aspiration rather than a concrete understanding of the circumstances in which its rule will have to function. As the SEC’s retooled regulatory analysis takes hold and the SEC applies it more, there is reason to be optimistic that SEC analysis will improve. Furthermore, as federal financial regulators exercise their increased powers under the Dodd-Frank Act, the role of economic analysis in SEC rulemaking could reveal best practices from which other agencies could learn or highlight significant pitfalls they should avoid in economic analysis of their own rules. In addition, the SEC’s interpretation of its statutory rule-making obligations can provide insights for Congress as it considers various regulatory reform bills designed to foster the use of economic analysis in agency decision making.